The Vikings created a lot of quick pressure using stunts and blitzes to force Josh Rosen to get rid of the ball quickly and check the ball down often. The Cardinals had no answer, and this created a free sprint towards the quarterback for a Vikings pass-rusher on multiple times throughout the game. Sheldon Richardson was disruptive in run defense, shedding and eating blocks on the interior. Edge defender Danielle Hunter came through on some key plays, including beating a block on a fourth down play in the first half to disrupt the run in the backfield, as well as a sack on the Cardinals’ final possession. Apart from his second-quarter interception, Kirk Cousins played a solid game for the Vikings. He completed over 70 percent of his passes but had six passes batted down at the line of scrimmage. Cousins connected with his favorite receiver, Adam Theilen, 11 times with one being a perfectly placed touchdown pass. Minnesota was finally able to establish the run and rushed 32 times for 195 yards. Latavius Murray broke multiple runs of 20-plus yards, and the offensive line moved Cardinals defenders out of their gaps a number of times. The run game should get even more potent when Dalvin Cook returns from injury. Rosen was under heavy pressure throughout much of the day and didn’t get a lot of chances to make plays. However, the few times he was provided time in the pocket, he made some nice throws for completions into tight coverage, including a well placed deep pass that Larry Fitzgerald uncharacteristically could not come down with. Rosen had one very poor decision in an attempt to force Fitzgerald the ball, as the defender read it the whole way for an interception. Rookie receiver Christian Kirk was a bright spot, providing a spark on offense and generating some first downs. David Johnson did not have a lot of room to run throughout the day, with the Cardinals’ offensive line unable to generate much push. Johnson lost a fumble early and also dropped a pass in the red zone. 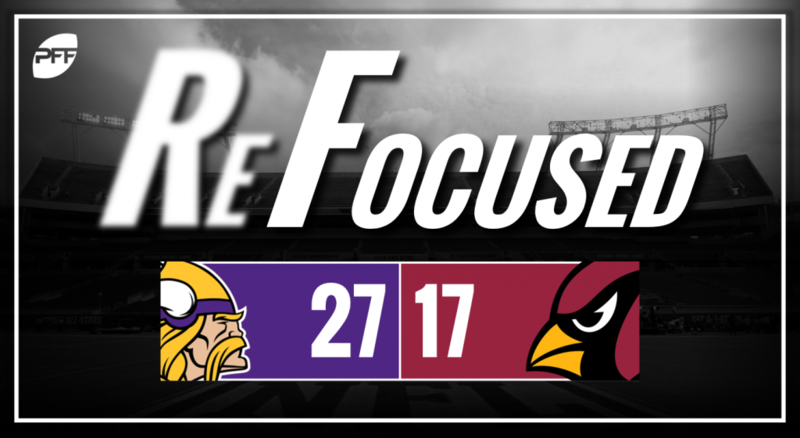 The Cardinals’ run defense struggled mightily against the Vikings, losing gap discipline on a few big runs and unable to make the tackle for loss when the opportunity was there. Fatigue may have played a part after being on the field the majority of the first half, but they were unable to slow the Vikings’ ground attack as the game went on, allowing 6.1 yards per rush. The Cardinals were able to bat down six passes at the line of scrimmage, and Chandler Jones was one of the few bright spots, recording 1.5 sacks and pressuring Cousins numerous times. After his interception, Cousins was solid for the remainder of the game while the Vikings’ offense dominated on the ground, rushing for nearly 200 yards and leading them to their third win of the season. A lackluster performance from the Cardinals’ offensive line and Rosen’s up-and-down play kept Arizona from pulling off an upset over Minnesota.